A very creative concept, this raincoat holds. Purifying rain water instantly is literally a strange but useful concept for those who lacks pure water in their territory. 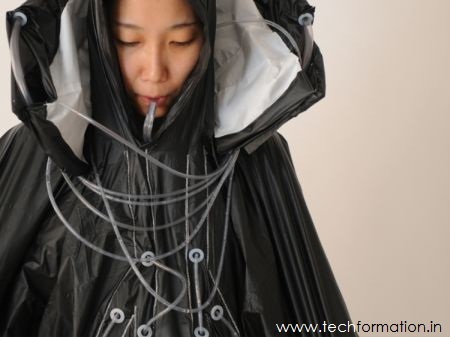 This raincoat can collect some amount of rain water with the help of tall collars and can be purified via some built-in charcoal filters and some sort of chemical purification. The water will be stored in shoulder bags after purification and some tubes are provided for drinking them when needed.